Remember that commercial- the one with the lady who smoked through the open hole in her neck? Debi Austin first appeared on television in 1996, telling viewers she began smoking at age 13 and could never quit. In a raspy smoker’s voice, Austin told the camera, “They say nicotine isn’t addictive” before inhaling from a lit cigarette held to a hole, called a stoma, cut in her throat that allowed her to breathe after her larynx was removed at the young age of 42. Smoking aged her because she seemed so much older in the commercial than she was. Four months after the ad, Debi Austin quit smoking – halting a two- to three-pack-a-day habit. She fought various forms of cancer for the rest of her life. Sadly, she passed away years later after waging a very public campaign against the hazards of smoking that had taken her health and eventually her life. I remember that commercial because it freaked me out. It was so sad and honestly, gross to see her still smoking, even after having her voice box removed. I knew from the day I saw that commercial I would never touch a cigarette because I didn’t want to become the next Debi Austin. While younger generations have taken heed against the dangers of cigarette smoking, they seem to be leaning more towards vaping or e-cigs. According to Science News for Students, last year, one in every four high-school students and more than one in every 14 students in middle school used some form of tobacco products. And yes, e-cigarettes are considered a tobacco product. The fluid or e-liquid that they heat up to create their vapors contains nicotine. It’s the chemical in tobacco leaves that makes tobacco so stimulating to the brain — and so addictive. In a recent NPR article published during December 2017, the number of teens abusing drugs is lower than it’s been since the 1990’s but the very high and very fast uptake of electronic vaping devices is a national concern. Teenagers are vaping, and they are doing it often. Vaping has grown in popularity with the rise of e-cigarettes, which were introduced to the mass market in the U.S. in 2007. Vaping devices include not just e-cigarettes, but also vape pens and advanced personal vaporizers called MODS and juuls. E-cigarettes can work in a couple of different ways. The most common pen-shaped rechargeable devices have a refillable tank that holds a nicotine-laced liquid flavor compound. The liquid is then vaporized but not burned by a heating element to produce an aerosol that delivers nicotine to the user. As a practicing Psychotherapist who specializes in working with teenagers, I have seen the rise of the e-cig, vape pen and the juul. Kids talk about smoking in the bathroom at school, sneaking puffs when teachers aren’t looking, and being able to smoke in common areas like movie theaters and sporting events. The discretion on where and when to smoke seems to be blurry and teenagers are pushing the envelope more than ever before because they don’t see anything wrong with vaping. It’s the new “Everyone does it”. This generation of vapers will argue it’s less harmful than cigarettes, but researchers say it is too early to know the true long-term effects of the vaping. It hasn’t been around long enough to know what is truly happening to the bodies of those who chose to puff away regularly on their vape pen or e-cig. As a parent, what can we do to educate and enlighten our kids to the dangers associated with vaping? The best way to handle hot-topic issues with your teenager is to communicate your concerns and share more fact, less feeling. When we, as parents, concentrate on how we feel (“It worries me” or “My grandma died from smoking” or “What if…”) our teenagers just think we are clueless, close-minded, and old-fashioned. Arming ourselves with known facts, and passing them along to our teenager, is the best way to share concerns related to them and their choices. Ask questions of them, not in a way that makes them defensive but more in a manner that opens the lines of communication. Say things like “I read this ___________, what have you heard?”. If your teenager wants to strike up a conversation and argue that it’s okay to vape or smoke an e-cig, here are 4 important talking points. Myth: It’s better than cigarettes. Truth: One key thing to remember about vaping is that, although it’s not the same as smoking traditional cigarettes, it is a replacement for smoking. They are similar. A new study by the University of California, San Francisco found that adolescents who use products, such as e-cigarettes, hookahs, non-cigarette combustible tobacco or smokeless tobacco, are more likely to start smoking traditional cigarettes within a year. To be more specific, 30.7 percent of e-cig users started smoking cigarettes within 6 months. E-cigarettes don’t burn tobacco as true cigarettes do but they still are considered tobacco products because the e-juice or liquids that are vaporized in e-cigarettes usually contain nicotine, a highly addictive substance. Experts worry that the popularity of vape pens is putting a new generation at risk of nicotine dependence. Myth: Vaping has no health risks. Truth: Vaping has its own potential risks of health problems. A 2016 study by the University of North Carolina suggests that vaping can cause harm by suppressing users’ immune systems. Professor Iona Jaspers and her research team found that smoking tobacco cigarettes suppressed key immune system-related genes, they also observed that vaping has the same effect. The fact that vaping also appears to suppress hundreds of additional immune genes means that, in this sense, vaping could be worse than smoking. Another recent study from the University of Rochester, New York investigated what the vapors inhaled from electronic cigarettes might be doing to mouth cells. Irfan Rahman his team showed those vapors inflame mouth cells in ways that could potentially promote gum disease. That gum damage can destroy the tissues that hold teeth in place. Severe gum disease could lead to tooth loss, bleeding mouths and bleeding throats. E-cig aerosol also contains propylene glycol which is related to formaldehyde and when propionaldehyde accumulates in the body, it increases the potential for liver damage. We are just starting to know the health implications created by vaping or dripping, which is when users pull apart the device and pour drops of e-liquid directly onto the coil and quickly inhale getting a stronger hit of nicotine. Vaping is anything but risk-free. Truth: Vaping is more than water, it is an aerosol. Anytime we inhale hot chemicals into our lungs, it’s not good for us. In an article by NBC News published March 2018, it shared the recent study that vaping deliveries harmful chemicals that are not listed on the ingredients of the vape-liquids. Smoking e-cigarettes delivers cancer causing chemicals into the body and– popular fruity flavors appear to be the worst. 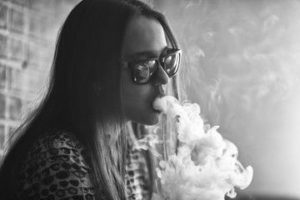 To capture the younger generation, vaping was sold to teenagers as “just inhaling hot water” but contrary to what marketing materials may say, e-cigarettes produce a lot more than just “harmless” water vapor. Myth: It’s fun and the flavors are fruity and delicious. Electronic cigarettes renormalize smoking, an act that has become less and less socially acceptable over the past 20 years. Electronic cigarettes have the potential to act as a gateway to tobacco-based cigarettes and something that starts as “fun” can easily turn into an addiction that is no fun to try to break. While vaping does not include tobacco, it does include nicotine and that can lead to high blood pressure, mouth and throat issues, fatigue, and sudden mood changes, and that it can lead to a lifelong, expensive, and health-harming addiction. There are more than 8,000 different flavors of electronic cigarettes now on the market — many of them with candy-like flavors of caramel, blue raspberry rollupz, berry peepers, and deep-fried apple pie that appeal to young people — but little is known about the safety of the chemical compounds behind those flavors when they are inhaled. A 2015 study by researchers at Harvard University’s T.H. Chan School of Public Health found that most of the flavored e-cigarette liquids they tested contained diacetyl, a chemical linked to severe respiratory disease when inhaled. A study published in the journal “Tobacco Control” revealed high exposure levels to certain chemicals found in some flavorings that could spur respiratory irritation. The researchers found that some of the more popular flavor chemicals used were benzaldehyde and vanillin and flavored e-liquids don’t often list the levels of specific chemicals used in flavorings, so most users have little idea as to what they are putting in their bodies. Teenagers need to know the facts. It’s important to remember that just because something doesn’t taste like tobacco doesn’t mean it is safe. The vapor produced by e-cigs or vaping pens is not just a harmless water vapor but contains some of the same very harmful chemicals found in the cigarettes’. Generations before us have learned a very painful lesson about the dangers of smoking and yet teenagers seem to be walking right back into the lion den by buying into the trend of vaping. Debi Austin was the poster child for do not smoke cigarettes. She learned the hard and shocking way about smoking. Who will be the unfortunate poster child for the dangers of vaping and e-cigs? Let’s hope our kids will wise up to the dangers of vaping before it is too late. ← Does a Piece of Plastic Buy Self Esteem? Kelly – Thank you for all of this information. I cannot believe the number of kids I see vaping while they are walking out of school. My daughter has said that many kids are actually vaping in class – what the heck?! I agree that we don’t know what long term affects this will have on young people and I see a whole other epidemic starting up. Love your blog! Thank you Kristin! It is so scary- like you said- kids vaping in class. I hope they consider the long term effects of their decisions and potential health hazards.